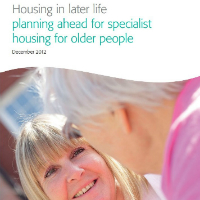 Tetlow King Planning (TKP) collaborated in a consortium of leading housing partners to launch Housing in Later Life: Planning Ahead for Specialist Housing for Older People. The Toolkit is designed to assist local government with planning for specialist housing for older people as part of an overall strategy on older people’s housing, care and support. Despite predictions that 60% of all new household growth by 2033 will be by those aged over 65, and the fact that over a third of older people would be interested in the idea of retirement housing, figures show that building of specialist homes for older people is lower than the 1980s, with less than 2000 built for sale in 2010. The consortium, which includes McCarthy & Stone, the National Housing Federation, the Housing Learning and Improvement Network, Contact Consulting and Tetlow King Planning, launched the toolkit at the Housing LIN Extra Care Annual Conference in London on 12 December 2012. The publication of the Toolkit follows the report by the All Party Parliamentary Group on Housing and Care for Older People entitled Housing our Ageing Population: Plan for Implementation (HAPPI2) to which Robin Tetlow of TKP contributed both oral and written evidence. The report emphasised the importance of older people being offered choice and opportunity in old age, including the right housing and care solutions at the appropriate time. To encourage local authorities to join up planning, housing and social care policy. “We are very pleased to be associated with this toolkit. It offers simple practical advice to local authorities. Hopefully it will result in greater innovation; and enable the delivery of both a greater quantum and a wider diversity of housing and care solutions appropriate to local demands and needs”.